With the leaks that came out ahead of the official announcement, one could argue that Google’s thunder was stolen, and from a standpoint of understanding the specifications, pricing and availability, that is true. However, there is “knowing” and then there is “holding it in your hands” which makes all the difference in the world. The new Nexus 7 is a great tablet to behold. We know that full HD displays are becoming commonplace, but the screen on the Nexus 7 is simply stunning. Moreover, one also really appreciate the stock Android experience when it is paired with powerful underpinnings. The quad-core Qualcomm snapdragon processor has absolutely no problem handling Android 4.3 and while it does not bring a super laundry list of changes, some features are no doubt going to be welcome, like solid battery performance courtesy of Project Roadrunner. The Nexus 7 goes on sale next week, starting at just $229 for the 16GB model which is a fantastic price for the hardware involved. Grrr my next tablet for sure...now I just need to figure out which phone? This screen looks amazing, I would buy it for the screen alone! Yeah, I am wondering whether to get the Nexus 7 and pass on a Note III. I can use my Note II as a Wi-Fi hotspot to get Internet access. Decisions, decisions, decisions. Agree...320+ ppi on a 7 inch is no mock matter. Quality product for quality price! I thought the hands-on should've been longer and a l'le more detailed. Awesome design. I'll stick with my original Nexus 7, though! 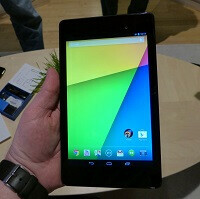 Its just a beefed up Nexus 7 will a way better screen. Current Nexus 7 is still fine if you don't care about the latest specs/benchmarks. @ 1:26 "...project road runner" Did I miss something during the live presentation? Because I didn't hear any mention of a project road runner included among the features presented at the keynote. EDIT: As far as I remember, project road runner was supposedly a rumored feature for upcoming versions of android but was ultimately not true. Unless I'm wrong? That's exactly what I was thinking too. I guess just the name itself was false but clearly they worked on improving battery life anyway, so Project Roadrunner it is then. iPAD mini is not amused. Don't forget the SoC of the iPmini - this is where the 1G Sammy tablet was. Back in what, 2009? Talk about obsolete, sheesh. Android is a much more powerful OS and it does a lot more than IOS/WP. Android has always had real multitasking and IOS 7 is just now getting it for example. Also, iPad mini is not made like a toy. Nexus a great first tablet for a child. Should had been made by Leap, not Asus. Only because Apple kept the functionality of iOS 'constrained'. See how well the iPmini handles iOS v. 7. Or, if it handles it at all. I'm kind of upset that my laptop's monitor is too low resolution to get a feel for how the display is on a screen less than half the size. what finally. lte for verizon, att and tmobile? so its a quad band? unlocked tablet for 350!!! I had to have a good chuckle the other day watching an elderly couple that were interested in purchasing a galaxy tab 2 10.1 Customer : "I want to stick a 3G USB dongle in it to access the internet" Sales person : "Um..Ah.. It doesn't have a USB slot.... (he should have said driver support) You'll have to purchase the more expensive version with sim card support" Customer: (blank look on his face) "Oh.. OK. We'll mainly be using it to print photos" Sales person: "Oh.. Umm..Ahh...Ahh... That depends on the printer (again completely ignoring the lack of driver support on android, both for cameras and external printers)... blah blah..blah.. more nonsense that I couldn't listen to. Rather than say something like "What you're after is one of the cheaper Atom based Windows 8 tablets" he kept "umming and ahhing" pathetic excuses, ultimately trying to sell them something they didn't want or need. A true fanboy at his best.